The new edition of this hugely successful book continues to present a unique understanding of the role of fascia in healthy movement and postural distortion which is of vital importance to bodyworkers and movement therapists worldwide. Fully updated throughout and now with accompanying website (www.myersmyofascialmeridians.com), Anatomy Trains: Myofascial Meridians for Manual and Movement Therapists will be ideal for all those professionals who have an interest in human movement: massage therapists, structural integration practitioners, craniosacral therapists, yoga teachers, osteopaths, manual therapists, physiotherapists, athletic trainers, personal trainers, dance and movement teachers, chiropractors and acupuncturists. As we seek solutions to the frequently complex biomechanical puzzles posed by those who consult us, Tom Myers' insight into the fascial networks of the body can often point to practical therapeutic options. The Anatomy Trains metaphor is a revelation; a way of seeing the body's interconnectedness more clearly, offering new physiological and anatomical perspectives, and therefore different clinical choices. Quite simply the content of this book is revolutionary. Clinicians, researchers and educators alike will find this an invaluable text, which leads to new insights on each reading. Any body of work that demonstrates the interconnectedness of the body and fosters appreciation of the whole over the sum of available parts is a must in today’s health and fitness market. Anatomy Trains champions a wider scope of the body and its movement systems. Tom Myers' masterful second edition of Anatomy Trains incorporates the most recent scientific concepts into a framework for understanding and practicing deep tissue work. Readers will gain insight into both basic and clinical research issues, how the science could influence clinical practice, and vice versa. Completely redone illustrations show anatomy from the cellular to the whole body level, describing both structure and function. Clinicians, researchers and educators alike will find this an invaluable text, which leads to new insights on each reading. Using Tom Myers' Anatomy Trains concepts and techniques in my chiropractic practice has improved my ability to see the source of my patient's problem and more efficiently target the soft tissue structures involved. As a result, injuries resolve more quickly, chronic problems respond well, and my adjustments are more effective because they are supported by the soft tissue. I highly recommend Anatomy Trains as a valuable asset for chiropractors and other practitioners using manipulation in their practices. Dr Andrea Coates Vinson, D.C. Integration and Myofascial Therapy programs of the CORE Institute. Myers has discovered the critical interconnections of the myofascial web and communicates his vision in a language that honors both the art and science of somatic therapies. For everyone interested in integrative medicine and functional anatomy, this artistic book is recommended. It even makes studying functional anatomy enjoyable. The beauty of Tom Myers' work is that it is as useful for a wide range of bodyworkers, from movement or energy therapists to manipulative manual specialists, rather than simply demonstrating rote techniques, Anatomy Trains provides a deep understanding of strain patterns in the body to enable creative and effective solutions for the issues we encounter in a bodywork practice. Our field is fortunate to have the talent and skill of Tom Myers and his ability to articulate his findings. His study, discoveries and syntheses are clearly defined and easily applicable for anyone who works with the body. His documentation of the body's structure and function containing spiral pathways inspire people to rethink the idea of 'straight line' movement. Judith Aston, M.F.A. Somatic Pioneer teaching bodywork, movement, and fitness for over 40 years. Anatomy Trains will help physicians, therapists and bodyworkers of all backgrounds break away from the prevalent traditional, mechanistic view of how the body works and is to be treated and will then push you headfirst into a logical, systems oriented view that has helped expand my diagnostic and treatment paradigms as well as my personal practice enormously. Chris Frederick, Physical Therapist, Certified Flexibility Specialist, Professional Structural Integrator, Director Stretch to Win Institute. Training optimal movement patterns requires an understanding of how the body regions connect and work in synergy. Anatomy Trains is an essential guide for understanding key myofascial lines which when in tensegrity facilitate optimal movement and postural patterns. Keep the train rolling, Tom. All aboard everyone! Anatomy Trains revolutionizes the teaching and learning of Pilates. In Russia, this book turns a new page in rehabilitation, osteopathy, orthopaedics, sport medicine and sports. It opens a new horizon in understanding the basics of movement patterns and posture; it gives a unique chance to gain awareness of formation of skolioses and movement stereotypes. It will allow you to make quality changes in you medical and sports practices to achieve amazing results very rapidly. I am recommending this book to friends and colleagues and keep using the concepts of Anatomy Trains in my everyday practice with great success. There is no doubt that this beautiful and inspiring book will contribute many important insights to the scientific understanding of musculoskeletal function. Tom's Anatomy Trains book and in depth practical studies represent/reveal an invaluable and vivid insight/understanding into how the body has pre-organized its movement functions via the flexible fabric (cut on the bias) from within. The story and strategies of the body’s movement and the related posture is visually introduced with a wealth of "functional" information. This body of work profoundly contributes to the foundation of my teachings. It is the manual/handbook for any serious teacher or student of movement. movement teachers and for educators in a larger sense. This book is written in a way, that it leads directly into practical application. An excellent teaching/study aid for all bodyworkers. An unusually interesting guide to living anatomy - an excellent way to visualize the anatomy of movement. Highly recommended. 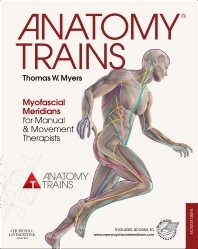 As a movement professional it is essential to study the brilliance of anatomist Tom Myers in Anatomy Trains. When you actually see the connectedness and order of the body you begin to understand how one action can move through and effect so many others areas. Bravo! Thomas Myers is one of the pre-eminent practitioners and teachers of connective tissue matters. Originally trained as a Rolfer, he has taken his research to a completely new level, presenting current material about connective tissue that continues to pour out of clinical studies at an ever-increasing pace. Anatomy Trains is the magnum compendium of his experience, thinking and teaching. Here you will find a wealth of information about the nature of fascia, its treatment, and its relationships to many other somatic systems. This book is a must-own, must-read for any serious practitioner of bodywork. It will deepen your knowledge and practical applications regardless of what your training background has been.